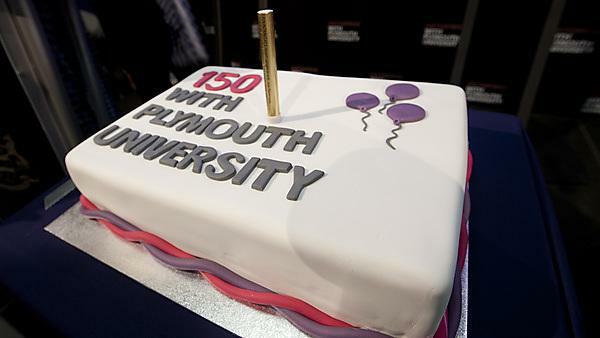 The University of Plymouth's 150th anniversary day was an opportunity to mark 150 years since the establishment of the School of Navigation on 24 October 1862, and to celebrate this we held a birthday party! The day included a 'Curious Campus' campus tour - a promenade performance which took us on an interactive adventure through time with a famous Victorian tour guide, incorporating our exciting 150th anniversary legacy and a range of exhibitions in art, literature and film. Campus building plaques reflecting the historical naming conventions for our campus buildings. Trails celebrating the geology, artwork, botanical and heritage attributes of our campus. Endangered rare trees planted to celebrate our international partnerships. 'Sea Portraits' exhibition of Plymouth People inextricably connected with the sea - a Blue Project with the University of Plymouth. The official launch of 'enterprise', a new 150th sculpture designed by the University of Plymouth students. The launch of the inaugural Plymouth Print, designed by a recent University of Plymouth graduate, and a call for submissions for the next annual Plymouth Print. Prize giving for and exhibitions of student competitions run through the anniversary year including 150th imagery presented through social media. A reflection of the significant partnership activities undertaken during our anniversary year, many of which involved our students - from publications and campus artwork to inspirational performances. An opportunity to meet those who participated in the year in one way or another! The ketch, TS Tectona, formerly the training ship of Plymouth School of Navigation, was moored at the Commercial Quay Pontoon on Plymouth Barbican during the day and was open to visitors. The two new vessels of the University of Plymouth - the Research Vessel Falcon Spirit and the 45-foot training yacht Take the Helm - were also alongside the Barbican Landing Stage, paying tribute to the history and legacy of Tectona. They too were open to visitors. Tectona is now privately owned and run by the Tectona Trust, and has recently completed a Round Great Britain 'Voyage of Recovery'. She is involved with the University of Plymouth and the University of Plymouth's Faculty of Medicine and Dentistry in aspects of medical research associated with Sail Training. She is operated by Island Trust of Cremyll.